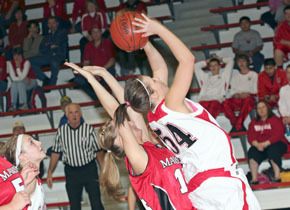 That may or may not have been the case for the Boone Central girls basketball team last week. While the Lady Cardinals were happy to add two more wins to their season total, they were also disappointed by their first loss of 2009-10. After runaway victories over O’Neill and Madison, Boone Central was defeated at West Point Central Catholic Saturday in a Mid-State Conference battle between the #3 ranked teams in Classes C1 and C2 (Omaha World-Herald). The busy week started on a much better note, as Boone Central blasted host O’Neill 57-28 Tuesday in a make-up game previously postponed by bad weather. The Cardinals, eager to be back on the court after having their first two post-holiday break games wiped out by snow and bad road conditions, raced to a 17-7 first-quarter lead and were never threatened. Boone Central had little trouble securing its 10th straight victory Friday, running away from visiting Madison 54-29 with another excellent defensive performance. “We played very hard on the defensive end,” Kennedy praised. “We were able to get 44 defensive touches, which is a phenomenal amount. It shows how well we defended and how much we harassed their ball-handlers. Boone Central could not find enough answers offensively or defensively in what was probably its toughest test to date Saturday, dropping a 54-40 decision to host West Point Central Catholic. In a contest closer than the final score might indicate, Central Catholic (9-1) outscored the Cardinals by two points in each of the first two quarter to take a 27-23 halftime edge. The Bluejays doubled that advantage going into the fourth period despite a pair of third-quarter three-point field goals by Erica Carder, then used nine free throws in the final stanza to secure the Mid-State Conference win. “We struggled shooting from the perimeter, didn’t get the ball inside to our post players enough and gave up 36 free throws,” Kennedy noted. “Yet, going into the fourth quarter, we only trailed by eight points. Complete Details & Stats in Print & Online Editions of Albion News.